Falcon Structures usually recommends customers transport their modified shipping container with a semi-truck. However, occasionally there are cases where towing a container on a chassis, a frame on wheels that carries the container, is the best solution. If a business plans to regularly tow their container over poorly-maintained roads or if the container needs some extra height on-site, Falcon will offer a chassis as an option. Below are two use-cases where a chassis was a good fit for a container structure. A customer was seeking a place to store emergency equipment for their warehouse which had a raised loading dock. They had hoped to locate the storage just outside the warehouse. However, there wasn’t room for storage on the loading dock, and placing the container below, at ground level, would have created too many obstacles for fast emergency response. They needed storage that would be level with the dock, but not on the dock. A chassis provided the container with enough extra height to be roughly flush with the loading dock. The customer simply parked the container at the edge of the warehouse, and the container became an extension of the dock space. In an emergency, employees can run directly to the container, roll-up the overhead door, and gather the necessary gear—no stairs necessary. The customer also appreciated the convenience of quickly hitching and relocating the container around the warehouse. This shipping container-based storage will be level with warehouse loading docks thanks to the chassis. 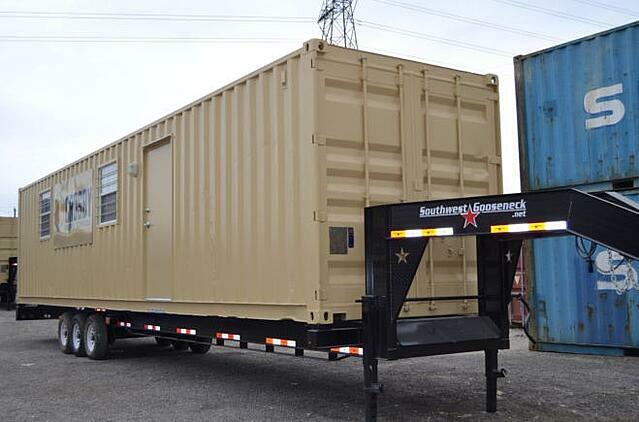 Another customer needed temporary housing for oil-field workers at wellheads. The roads to the oilfields can be as grueling as the work, and thus travel trailers and motor-homes quickly fell out of repair. Their shipping container-based living space can be transported and reused for decades instead of a few years, providing long-term savings. Containerized workforce housing also boosted morale in the field. Too often employee comfort suffered when damage from the road lead to leaks and failed climate control. Steel shipping containers were better suited to the challenging journey and climate of the oil-fields. We placed this container-based workforce housing unit on a chassis for frequent moves. Generally, our customers will use a six-wheel chassis with 10-ply tires and a goose-neck hitch suited for a heavy duty pick-up truck. Most of the businesses that choose to use a chassis to relocate shipping containers have considerable resources at their disposal. As discussed in our recent blog post, “Think Twice about Shipping Container Tiny Homes, Pools, and Bunkers” private individuals will likely find the costs, time and resources associated with maintaining a chassis and a truck to tow the container cumbersome. We advise careful thought and consideration for all container-based projects. As always, Falcon will work with customers to determine if a chassis is a good fit for a project, and offer guidance as needed. Wondering if a chassis is right for your shipping container project? We’re happy to answer your questions! Contact us at 877-704-0177 or email at sales@falconstructures.com.